How do you make sure that your Wedding Couples personality is reflected in the flower design? How do you work with the Bride & Groom to choose colour palettes and the style of flowers? Some Brides select flowers for their deeper meanings – do you have a favourite? 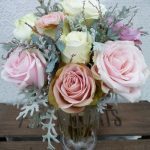 How much do the seasons impact on the flowers you can choose for a wedding? Thanks to Joanne for sharing her design skills and this beautiful wedding with us. Has the post inspired you? What flowers do you want for your wedding?